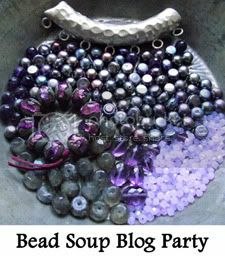 Regina's Writings: Bead Soup is Served! So I decided to challenge myself further and use most all of these beads she sent me. 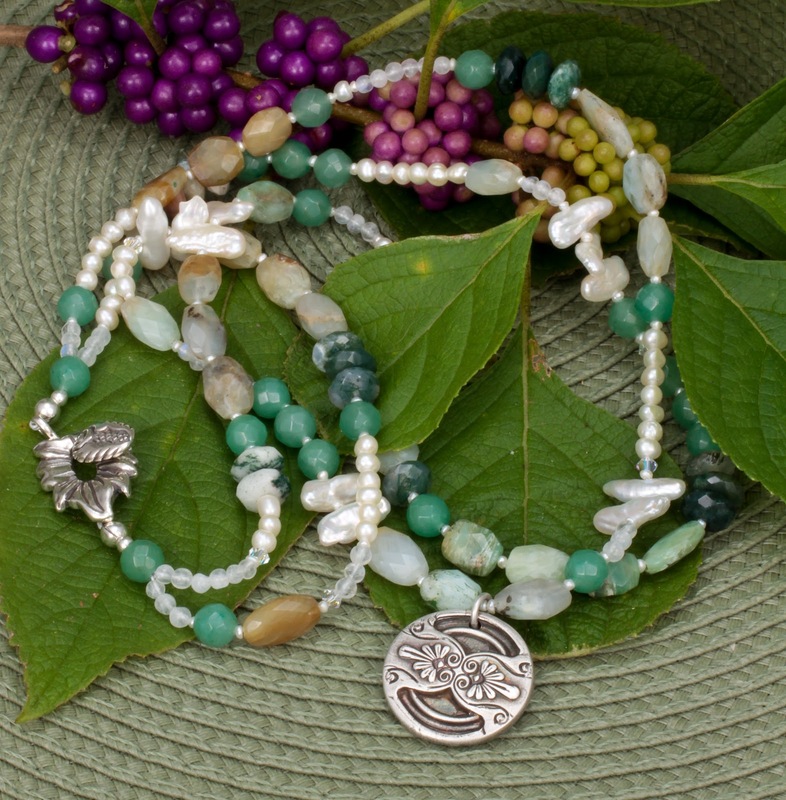 I added in a variety of white freshwater pearls, some green Agate rondelles and I present to you Misty Meadows! 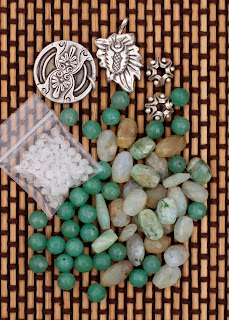 I did not use the two beautiful silver rondelle beads she sent me. I am saving it for the suitable partner beads to come along. Nothing I had in my stash seemed right for these beauties, so that will be for another time and day. 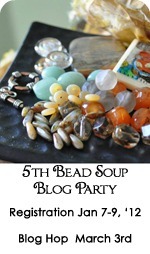 Please visit my partner Sandra and see what she has made with the bead soup I sent her. 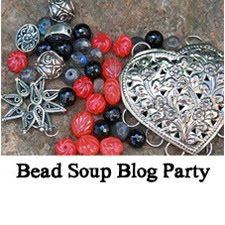 Now to say thank you to all you blog hopping bead soup loving beaders, I have some Pink Soup ingrediants to giveaway in honor of our lovely pink-haired host Lori Anderson of Pretty Things. 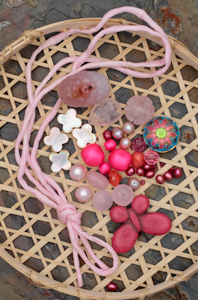 Cultured freshwater pearls in shades of pink. Become a follower, if are not one already. Leave a comment and that is all there is to it. You will be entered in the draw to randomly pick a winner. Winner will be picked and announced on August 31, 2012. 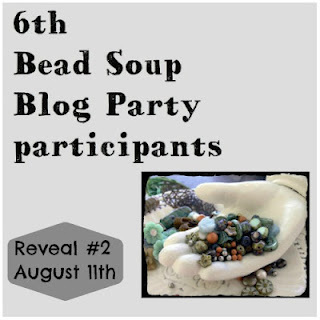 Thank you for stopping by... enjoy the bead soup party. I adore your design and the volume with two rows of beads. Lovely! 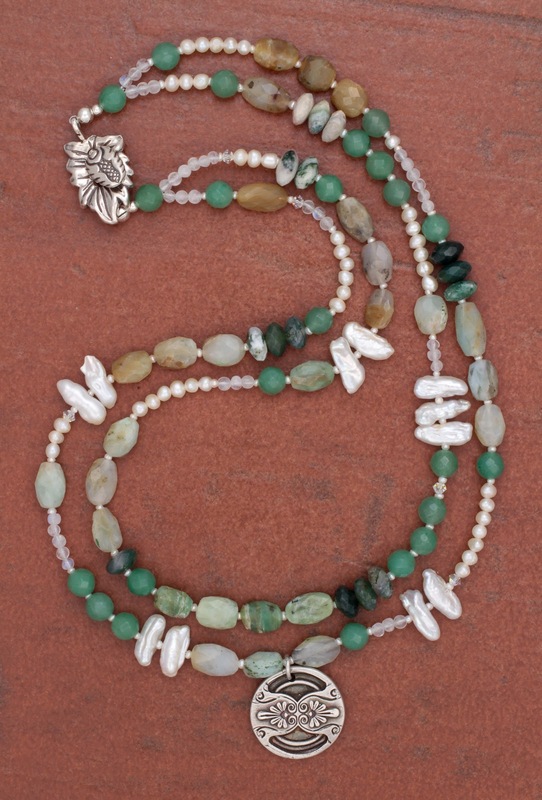 this necklace that is bound to be a favorite,frequently worn piece. The colors are so very soft and serene . A beautiful two strand piece..I love the addition of the pearls which really compliment the soft greens. How thoughtful of you to do a pink giveaway in honor of Lori...I'll put my hand up for that if open to OS participants. I am already a follower. I love the addition of fresh water pearls of various shapes in the necklace. It adds to the texture of the necklace. Nice! Love that focal & clasp. I think you did a nice job of making a statement piece with some classic and subtle components, Good work. Totally pretty and the focal is so beautiful! Yummy! The focal pendant is lovely and I think you showcased it beautifully. All those greens in the necklace makes it a rather 'tranquil' piece. It would be wonderful to wear to work to stave off any potential stress :-)! What a truly lovely necklace! Soft, easy colors, and great design. What a beautiful necklace you've created with the bead soup I sent you. I hope you enjoyed the challenge! Come visit my blog and let me know what you think. Your piece is so beautiful. can i borrow that for church tomorrow?! ha! Love the balance you created without being symmetrical. And I never know what to do with center drilled stick pearls. What a really pretty necklace you created. I like the layers you gave it. Beautifully done! 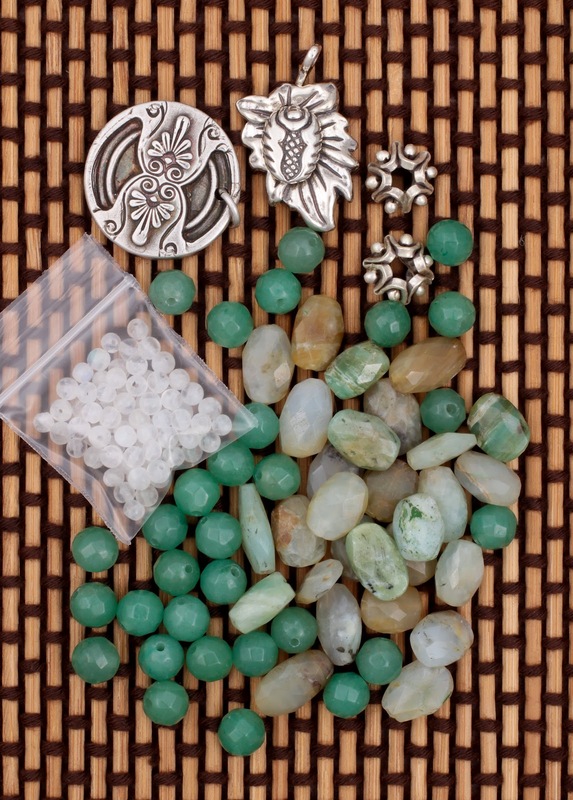 I love how you worked outside your box with the smaller beads and I feel your pain because mom and I usually work with big and bold beads and pendants. I think you nailed it with that necklace - gorgeous design and love all the beads/colors you used! Love your design, very beautiful. Just GORGEOUS! I love those stones! love it! the colors are soo cool! I really like your necklace and would love to be entered for the soup. I am now a follower. Now off to check out more of your blog. I just love that necklace! The colors are so muted and lovely. Oh Regina, love the piece, the name - everything! A very unique necklace !Congrats! You made it work. 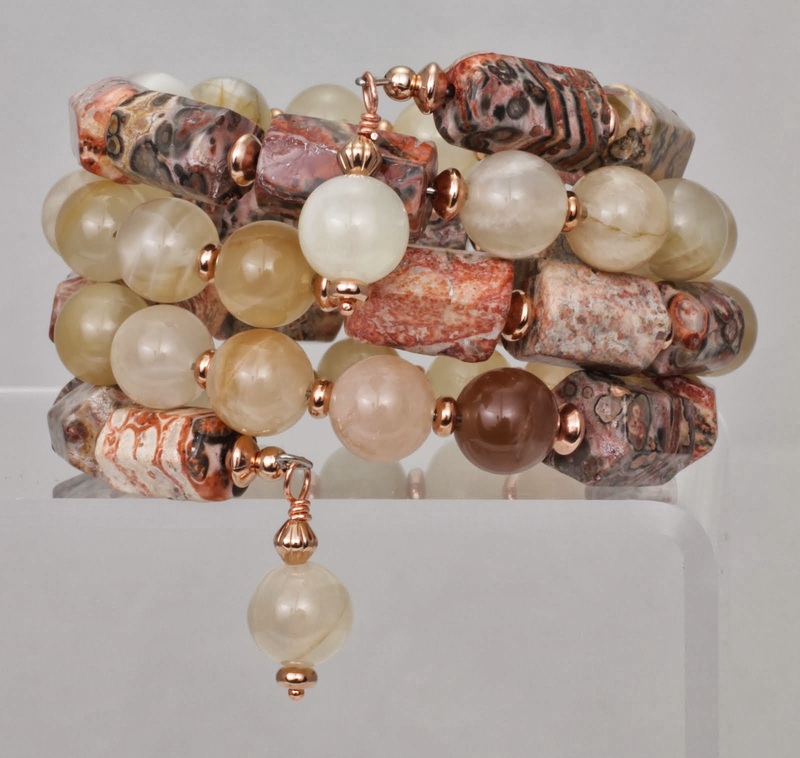 Beautiful wearable jewelry. Such a beautiful necklace! It reminds me of autumn when the leaves are just beginning to turn. I loved your design... amazing job using your bead soup! Super fun to hop and enjoy!! Very pretty necklace, the title suits it perfectly. Who can resist a pink soup? I love those butterflies. Very nice composition and use of the soup! Regina, you have really succeeded in fulfilling the premise of this challenge: as you said, these beads were not your usual choices. Yet you designed a gorgeous necklace within the colour scheme and style of your soup. "Misty Meadows" is a beautiful name... I bet those stones and pearls have a shifting quality when in different types of light. Misty Meadows is so fitting, very pretty. Beautiful! I love the mix of stones and pearls! Such a lovely design!! Nice job! Very thoughtful of you to do a giveaway in honor of our host...count me in! What a lovely serene piece! Very Celtic looking, in color and theme to my eye. Simply gorgeous Regina!!! I have a difficult time with asymmetry you do it so very well! I love your necklace it is so beautiful. Great design! I love the pearls added in to your necklace! Great length too! The focal and clasp work well with your design! What a beautiful necklace! I love the colors and how you show off the focal! Yummy soup. I really love how you tied everything together in your necklace so perfectly - it's beautiful. It's subtle, because of the colors, but it's also quite an eye-grabber!! Very nice design. Love that necklace. Those stick pearls give it such great interest and texture. It is beautiful. Great job! Love the focal and clasp you were sent and what you did when them. 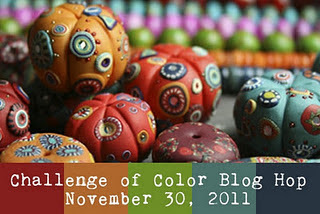 Of course I am real partial to those colors. I love that necklace, so soft and pretty! I love the idea of doing a give away in honor of Lori, and I am already a follower. I thimk you did a great job, especially being out of your comfort zone. Love the color and the stick pearls add a special draw. Very pretty necklace! I've become a follower too! Wonderful job on your necklace. Thanx for the chance to win pink beads. Pink is my favorite color. Luv the necklace! I luv double strand necklaces! Great job!!!! Sorry I am so late, I have been having computer issues! Very nice.... I like that you challenged yourself even further... you did great!! Beautiful! Multi strand necklaces always intimidate me. Great job!